Ubuntu MID edition has been released for handheld Mobile Internet Devices. It’s targeting devices based on Intel’s A100/110 and the new Centrino Atom platforms. Successors to the UMPC, MIDs are usually small formfactor and have a touchscreen, plus a physical keyboard. UMPC portal has a examples of devices that are currently supported by this release, inluding plamtops like the Kohjinsha SH6. This release is only for x86 devices, so don’t expect it to be ported to the ARM based Nokia N800/810. The user interface is based on the Hildon framework and we’re glad people are attempting to think beyond a standard UI. We hope they plan on punching up the use of the color brown in the final though; it just wouldn’t be an Ubuntu release without it. Charter Communications has announced that it will no longer be attempting to target advertising based on user actions. The original strategy would have involved inspecting the contents of every packet sent or received by the customer. This usage pattern is associated with a specific IP and relevant ads are displayed on sites using NebuAd when that IP visits. NebuAd doesn’t directly share the IP, but we’ve seen in the past, even with obfuscation, a user’s search patterns alone have been known to give away their identity. The majority of all internet traffic is plaintext, but endusers have an expectation of privacy. User backlash is what eventually caused Charter to back down, but that doesn’t mean companies like NebuAd are going to be any less common. [astralpancakes] wireless arcade stick project looks like a great place to start if you want a simple project. Well constructed arcade sticks can cost $100+, but with all the MAME cabinet builders, the parts have become easy to acquire. The stick has a rigid wooden case with a metal faceplate. All of the component connections are soldered to the pads of a Logitech wireless controller. [astralpancakes] built this specifically to play Street Fighter III: 3rd Strike. 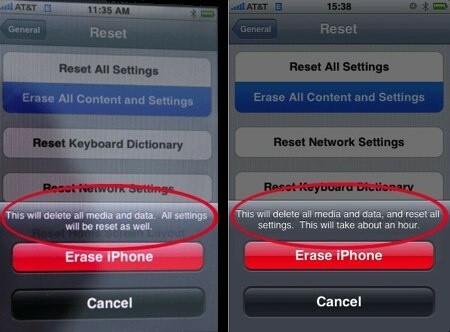 AppleInsider is reporting that iPhone Software v2.0 will add a secure wipe feature. The screenshot above shows the text “This will take about an hour.” added to the normal erase feature. This time is used to overwrite data to the disk multiple times. The need for secure phone erasure came to light after a researcher was able to recover personal information from a refurbished iPhone using forensic tools. Since then, a few people have published techniques for obliterating personal data using either the GUI or the more thorough command line method. Remote wipe has also been added to the new firmware in case the phone is stolen. We’re happy to see security being made easily accessible to nontechnical users and expect that remote wipe will become standard on laptops in the future. 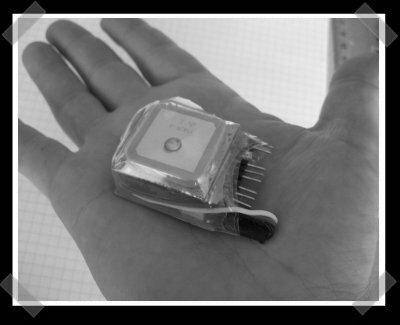 This is a nice, compact gps logger that’s built around a PIC16F872 and some eeprom chips. It was designed for a particular GPS receiver, but should be easily adaptable to others since the unit ouputs standard sentences at 4800 baud. Full schematics and board layout are available on the project page. The Fluid Site Specific Browser (SSB) is one of our favorite pieces of kit for Leopard. You can use Fluid to give web services you use constantly like Gmail, Facebook, Wikipedia, or Pandora their own icon and a browser tailored to that site’s specific workflow. Fluid based on WebKit and has plugin support among many other features. Embedded above is [Eric Eggert] showing how to create a reasonable Twitter client using it. The initial setup is identical to any other Fluid app: point it at https://twitter.com/. The clever bit is leveraging Fluid’s GreaseMonkey style userscripting support. He created a userscript to autorefresh. A second userscript is used to strip off all of the extraneous page elements leaving just the text field and the timeline. Every time you get a new message it generates a growl notification and you can even attach it to the status bar. Best of all: it avoids all API limitations since you’re accessing through the web interface. StopBadware.org has released their May 2008 Infected Sites Report(PDF). They took their current list of 213K active badware websites and resolved the IP addresses. These addresses were used to determine the network block owner and country. The results could be skewed to networks Google scans more often, but they should give a decent overall picture. 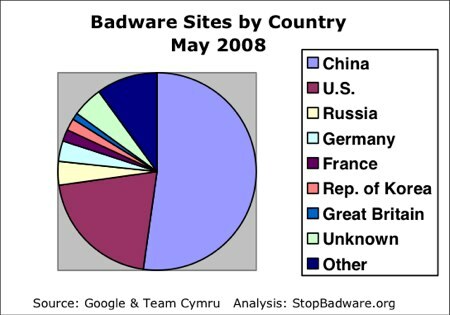 China hosts 52% of all the badware sites while the U.S. has 21%. There weren’t any other countries maintaining over 4% of the total. They also calculated the number of infected sites per capita, which China also led. Last year’s report resulted in several AS block maintainers cleaning up to the point that they don’t even make the top 250 this year.